Home > Marketing How-To > Should You Should Advertise on Facebook? 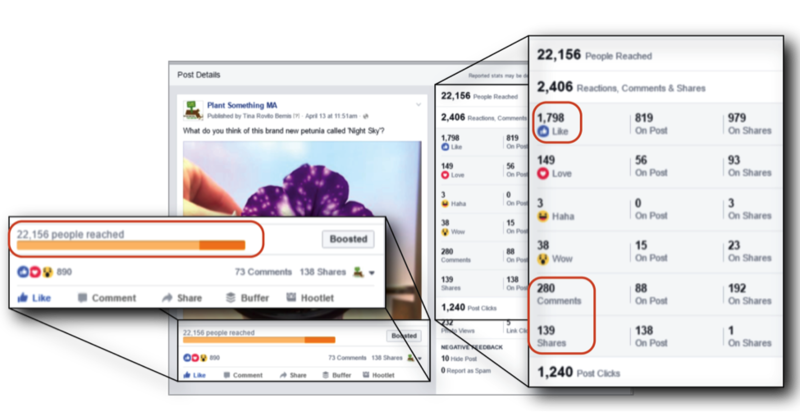 A Locowise study in April, 2015 found that the average reach for a Facebook post was about 4.11% of total page likes. That means if you have 100 fans, only 4 of them are likely to see your post. If your fans are excited about what you’re posting, Facebook may still work for you without any advertising. For example, one of my clients typically reaches 2-13% of their fans, but one recent post got commented and shared on so much that they achieved a 42% reach. They’ve never paid a penny for Facebook advertising. If my client’s main goal is to keep building its relationship with existing customers, it can probably get by without paying. But if they want to reach new people, I think they should pony up. Frankly, Facebook isn’t the right channel for some businesses or organizations, whether you advertise or not. For example, if you’re a solopreneur and just have a handful of clients, it may be hard to build a large, active fan community. But don’t assume that it can’t work for you, because your customers have “outgrown” Facebook or your clients are other businesses. With 167 million daily active US users, chances are that some of the people you’re trying to reach are on Facebook. Spending money advertising on Facebook (or anywhere else) only makes sense if it helps you reach your goals. For example, if you’re selling tickets for an event, you want the additional ticket sales to exceed the cost of advertising. In the above example, if you spend $100 on Facebook advertising and are able to reach 1000 people and get a 3% response, you will come out ahead. If your ad gets the same response rate, but only reaches 300 people, you will lose money. Keep in mind, however, that it’s generally more cost-effective to target people who are most likely to be interested in your offer, even if there are fewer of them. Facebook’s sophisticated tools for targeting potential customers make advertising on the social media platform enticing for marketers, like me. You can start advertising for a few dollars a day, so almost anyone can afford to try it out. And if you’re the slightest bit geeky, you can figure this stuff out yourself. Here are four tools I recommend, starting with the easiest one first. 1. Boosting Posts. For a fee, increase the number of news feeds your posts reach and have it appear higher up. Prices vary and depend on the number of “impressions” a post gets. For example, you can spend $20 to reach 460-1200 people. Have specific demographics or interests, or are based in a specific location. Plant Something Massachusetts is a consumer campaign to encourage more people to enjoy plants. They paid $20 two times to boost this post and reached 22,156 people. The lighter orange in the image above shows you the organic reach for the post, the darker orange the paid reach. At the time of the original post, the Plant Something MA Facebook page had 809 likes. Within 2 weeks, it had over 1,000 likes. 2. Custom audiences. Create a “Custom Audience” of people who are already on your email list. You can select specific demographics and traits to reach a specific segment of your mailing list. Targeting options include age, gender, language, interests, relationship status, and more. This is a great way to tell an existing customer who doesn’t always open your emails about an upcoming sale or event. If you have a large mailing list, you can choose to only target customers who live within 50 miles of Boston, unmarried women, people who garden, etc. 3. Lookalike audiences. Reach new people who share similar characteristics with your existing customers. You can use the same targeting as Custom Audience; age, gender, language, interests, behaviors, etc. You can base your Lookalike Audience on people who are on your email list, like your Page, or have visited your website. Facebook also enables you to exclude people who are already connected to you, so you can focus on reaching new people. 4. Remarketing. Advertise to people who have visited your website. You can create ads that get shown to everyone who’s visited your site in the last month, everyone who visited your Contact page but didn’t submit the form, or all sorts of subgroups. This is an excellent way to reach people who are already interested in your business. For instance, some people browse websites and don’t purchase anything because the products are slightly out of their price range. Remarketing allows you to target them with special deals that may be the difference between browsing and purchasing. Not convinced that you want to advertise? Facebook has a free tool called Audience Optimization that any of us can use to target our regular Facebook posts to people with specific interests. For example, in the image below, you can see that Facebook lets me target my post to people who like my page who also have expressed an interest in organic food. Initially, this won’t increase the number of Fans that see my post, unless I boost it. The people who will see the post, however, are particularly interested in the content, so they’ll be more likely to engage with it, which can help increase my organic reach.